I watched My Neighbor Totoro 2 weeks ago, and after I finished it, I knew that I was going to make a wallpaper from that movie. I began by searching for a scan. 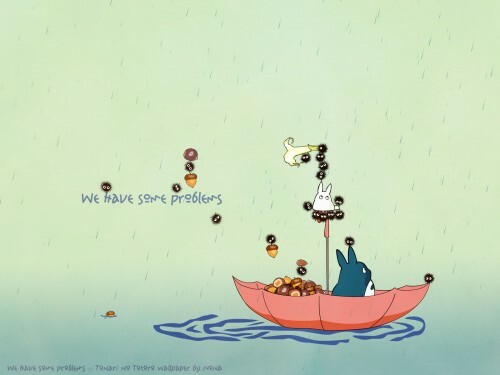 At first i wanted to have the Big Totoro on my wallpaper, with the umbrella, but I changed my mind. I knew I wanted to include an umbrella, so I started playing with my own to see if I could get a few concept ideas from it. I turned the umbrella upside-down and imagined two smaller totoros inside it. I thougth it would look cute, if I can manage to do this wallpaper. I vectored the umbrella from this Totoro scan, the Middle Totoro and the Little Totoro from this Totoro scan, the little black thinks, I don't know their name in english, I made them myself. For the seeds I used several stocks I vectored them too (used: this page and this [url=wwwold.sztaki.hu/~smarton/alma/csonthe(...) For the flower I used also a photo, and vectored it, but I don't remember which page i took if from, and despite all the searching, I coudn't manage to find it again either. >.< When I was finished wirt this all, I added the raid, with help of this tutorial, and searched a good font for the text. I added a little texture too, I found on DA!. Waaaahh! Sugoi wallpaper! I absolutely loved it! There's not too much information on it, so we can apreciate every detail of it better. i'm amazed about your vector skills! and your theme...i'm in looooove! aww so cute! thank you so much! It is so cute thanks for sharing! nice wallpaper~ thanks for sharing! Oh my gosh this wall is so adorable! Thanks for sharing!